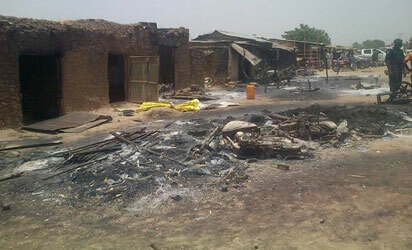 The Zamfara massacre came after around 25 people, including politicians who were on their way to Maiduguri, the Borno State capital to attend the All Progressives Congress, APC, stakeholders meeting/congress were slaughtered by suspected Boko Haram terrorists in separate attacks in Gwoza council area and along the Maiduguri‑ Biu road. A Nigerian soldier has also alleged that some military commanders were mercenaries of the Boko Haram sect and were paid by its sponsors. Military spokesman, Major General Chris Olukolade, however denied the allegation. Meanwhile, death toll in weekend’s massacre in Unguwar Galadima community in Zamfara State, yesterday, hit 200. This came as governor of the state, Abdulaziz Yari, who visited the village, yesterday, broke down in tears on sighting corpses of women, children and other residents of the village littering every part of the village. Our correspondent said the governor and other officials participated in the burial of 79 people killed in the attack by the cattle rustlers. This entry was posted in Breaking News, Men, News, Politics, Women and tagged 7 Others Also killed, Zamfara Massacre: 200 Reported Dead; 18 APC Supporters.